The culinary school I attended was a treasure trove of information! Priceless as far as amazing recipes! 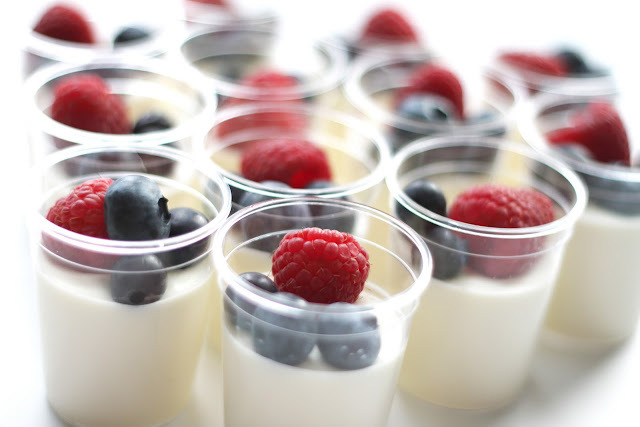 This vanilla bean panna cotta is one such recipe! Sweet and absolutely perfect in its simplicity! Panna cotta is Italian for "cooked cream." You can literally have this recipe ready to chill in the fridge in under 10 minutes! 5 if you are in a hurry! Just 4 ingredients! For how simple this recipe is, anyone you serve it to will wonder how long you slaved away in your kitchen to make it! It is that amazing! I made these little beauties for a good friend of mines baby shower and as expected, they were a hit! In a small dish sprinkle 1 tablespoon gelatin over 3 tablespoons water. Allow the gelatin to absorb the water. This is called "blooming." 5-10 minutes. While the gelatin is blooming, pour 4 cups heavy cream into a medium saucepan. Add 1/2 cup sugar and 1/2 of a vanilla bean. Split the 1/2 vanilla bean lengthwise and with the tip of your knife, scrape out the vanilla "caviar" from the bean and add it to the heavy cream mixture. Bring the cream mixture to just a simmer over medium heat, stirring frequently! Remove the pan from the heat and add the bloomed gelatin, stirring to allow it to dissolve in the cream mixture. Then pour into small cups or ramekins. Cover with foil and into the fridge to set up for at least 2 hours. This recipe makes approx. 25 1/4 cup servings. And don't forget to scroll down and enter the giveaway! It's so easy to enter and it closes at midnight tonight! I'll announce the winner Saturday (tomorrow) morning! Random question. Where did you find your clear cups? I'm looking for 4 oz clear plastic cups and can't find any like these! Hi Jill! I got my cups at Zurchers here in Orem! If you have a Zurchers up your way, perfect! If not, I'm sure any party supply store would have them! Or you can order from Zurchers online! I hope this helps! We do have a Zurchers! Thanks so much for the tip! Yay! Love Zurchers! Glad you have one!